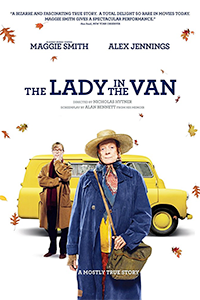 The Lady in the Van tells the true story of Alan Bennett’s strained friendship with Miss Mary Shepherd, an eccentric homeless woman whom Bennett befriended in the 1970s before allowing her temporarily to park her Bedford van in the driveway of his Camden home. She stayed there for 15 years. As the story develops Bennett learns that Miss Shepherd is really Margaret Fairchild (died 1989), a former gifted pupil of the pianist Alfred Cortot. She had played Chopin in a promenade concert, tried to become a nun, was committed to an institution by her brother, escaped, had an accident when her van was hit by a motorcyclist for which she believed herself to blame, and thereafter lived in fear of arrest.